STATEMENT: Mr. President, we are your people too. Please, let us go home! Mr. President, we are your people too. Please, let us go home! Not that we are not grateful for the tents provided us when we had no place to go, fleeing from the raging war. We are. But, although tents are good to sit and lie down under, shade from the blistering sun or to watch the stars at night on the beach by the sea or in campsites, even in the backyards or frontyards of our homes, tents were never meant to be lived in for years and years to come. Photo from the FB page of Let me Go Home Movement shows the bridge in Banggolo and the ruins. 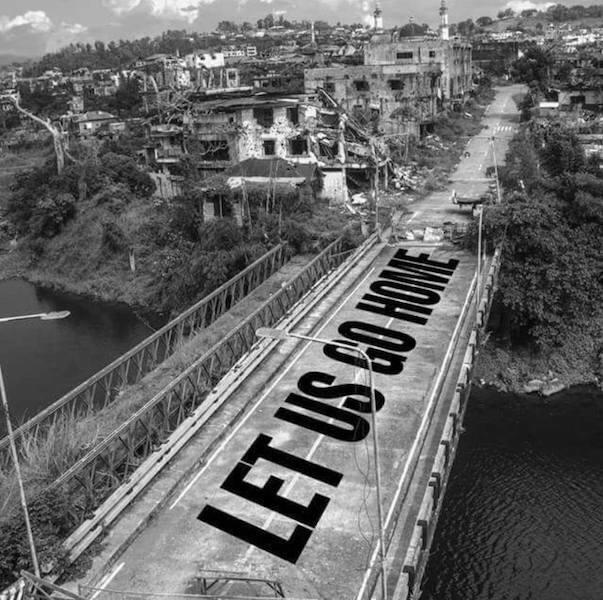 The photo was taken on October 7, 2018 but the text “Let us go home” is computer-generated. We were glad and grateful that we were housed in tents when we fled our homes in the city. Temporary shelters to rest our weary mind and souls, we thought. But it has been almost a year and a half since then. A long, long one and a half years. Babies were born here. Tent babies, we call them. Crawling on the makeshift wooden or bamboo floors. Learning how to walk on grounds that are muddy when it rains and swirling with dust when the sun shines. Babies shouldn’t grow this way. Babies should grow in the comfort of their homes. And, tents could never, would never be home. We are told that we cannot go back yet because ground zero is waiting to be cleared. But no clearing has started. Glitches in the clearing contract awarding, they said. Lack of qualified contractors with the proper tools, they said. 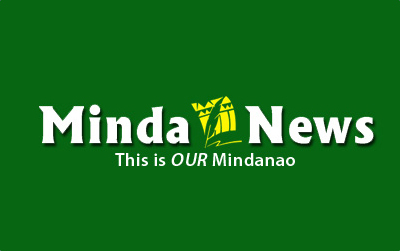 To the Task Force Bangon Marawi, the delay in the clearing may seem caution. But to us who live in tents, who have little to earn our keeps and living like beggars on dole outs, the delay seems neglect. A catalyst for breeding bitterness. So, here we are. People of the lake turned people of the tents. With shattered dreams and splintered lives. Distressed hearts and desperate souls. Visited, documented and gawked at by foreign and local assistance funding organizations and media. Our hapless, helpless conditions videoed and broadcasted. Reduced to nothing more than stirring images of the dismal consequences of a war we never wanted. Stirring images that fail to stir the bureaucratic hearts of those who can do something to hasten our going home to do something real with a keener sense of urgency. With more compassion. Let us rebuild our shattered houses. Let us make whole our splintered lives. Rekindle our shattered hopes. Relieve our distressed hearts. Revive our desperate souls. Let us go home so that we may become what we were and should be, people of the lake, no longer people of the tents anymore. Let us go home so that the silent masjid may be silent no more. May the peace and mercy, and blessings of God be with you.